I have worked on local campaigns for twenty years. I have never experienced anything like the Arroyo Grande write-in Jim Hill campaign. The write-in campaign brought together campaigners from all walks of life. None of the workers were close friends prior to the July 3 incident. But the outrage and frustration of being ignored at council meetings brought a core group together to paint signs, work corners on Saturdays, speak out, walk neighborhoods, and implement a media campaign in just four weeks. Without a fundraising event or solicitation letter, businesses and citizens literally asked the committee if they needed funding. The campaign raised over $5,000 quickly. The most critical aspect of the campaign’s success were the over 200 handmade signs. If you want to get people’s attention, hand paint large black letters on bright neon yellow poster board. More and more people and businesses requested them as they saw more neighbors displaying them. The groundswell of support started with the signs. Obtaining permission for sign locations was easier than anyone imagined. We were a nonpartisan bunch who was not afraid to knock on doors. Campaigners who personally walked into businesses to gain permission functioned as listening bartenders when these merchants divulged their true feelings and stories of their dealings with the city. Unfortunately we could only offer them a yellow sign and hope that the city council would take notice and respond to the message that 46 percent of the overall vote went to write-in candidate Jim Hill. These were votes for Jim Hill, and more importantly, these were votes against Tony Ferrara. In Arroyo Grande, 14.3 percent of submitted ballots did not vote for mayor in compared to 8.5 percent of San Luis Obispo voters, 4.5 percent of Pismo Beach voters and 4.8 percent voters in Grover Beach. Why so high in Arroyo Grande? Perhaps because voters forgot to check the bubble for Jim Hill or they saw no opponent. It’s also possible voters preferred to vote for no one. These ballots are among those requiring manual review. Perhaps voters are exhausted by the status quo. Perhaps they too did not believe the made up tea party story profusely defended by the city manager and mayor. In addition, the voters finally voted out longtime incumbent Joe Costello. The Hill campaigners gathered in the Village on Election Night to celebrate. With 58 percent of the poll voters voting for write-in candidate Jim Hill, the message has been sent to the city council and mayor that more than a “so called” small fringe group are not happy with the current leadership. Overall, incumbent Mayor Tony Ferrara tallied votes on only 46.7 percent of the submitted ballots. This is hardly a mandate. In fact, the mayor barely survived the election. With 2,095 ballots yet to be read, the mayorship of Arroyo Grande is still up for grabs. NOTE: On Sept. 19, 2014 Mayor Ferrara was sworn in as the President of the League of California Cities – a position that requires him to be a seated mayor. I had a “Write in Jim Hill” sign posted by the street. I planned to take it down on Wed. morning since I hate seeing campaign signs left up indefinitely after the elections. I also gave serious thought to replacing it with a “Thanks for voting, especially those who took the trouble to vote ‘write-in'” sign. However, between 7pm Tues and 7am on Wednesday, someone came by and removed the sign. Now that’s a Class Act for a politician. Thanks Jim and thanks to those who supported him. I still have my car window sign in my back window. Until the very, very last vote is counted, I am not giving up. In the days leading up to an election people often show support for a political candidate by placing signs in front yards and windows. Once the election’s over, however, these signs become “political litter” and it’s time to remove them. In the United States, the deadline for removing signs from your yard varies from city to city. For example, in San Ramon, California, you must remove signs within 10 days after the election and in Tuscon, Arizona, you’re allowed 15 days, but in Newton, Massachusetts, you only have two days following the election to take down the signs. In addition to this, your homeowner’s association, apartment’s lease agreement of condominium or co-op board may have alternative rules. If you’re not sure, it’s always safe to remove the signs the day after election. If you see a sign, please take it down. I am so proud to be part of the group who worked on the campaign. I hope that we are able to continue to raise awareness where it is needed and to work for change in AG. Thank you Jim for your thoughtful thanks to the community. You are not only a class act, but you are a true leader. On behalf of the citizens of this county, and the City of Arroyo Grande I want to personally THANK YOU! THANK YOU for the courage to stand up and not only be heard, but counted. THANK YOU for uniting not only Arroyo Grande, but the county as well against back door politics, maleficence, moral turpitude, and bullying. THANK YOU for returning the values and sense of pride we once all shared as a community. Arroyo Grande and the County of San Luis Obispo is a better place today because of your determination and tenacity. This may well be my all time fave! BRAVO that one gave me chills. yeah, pretty damn good. the lennon touch was xtra special. I never heard one negative thing from Jill Hill, and now these signs are showing up,now that is CLASS. I wish more politicians could run the campaign you folks ran, and hopefully the mayor will stop his negative comments and finger pointing. I know I am very tired of his actions and sure hope you prevail with the provisional ballots that still need to be counted. I will be at more council meetings now. I think you opened our eyes and I want to thank YOU for that. @TORYRAND: OMG, that wasjust perfect. This race is not over…..2,095 presumably informed voters, and when we saw informed voters vote, they voted Jim Hill at a rate of 60%. I saw that sign this AM on the way to work. 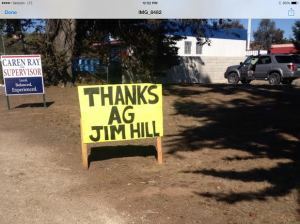 That’s the first “thank-you” sign I have ever seen from a candidate – that’s class in my humble, but most accurate opinion – glad I voted for Jim!!! Thoughtful, concise and clear. The message now should be, count all the ballots.